A group of indomitable and infamous pageant moms have been given the beauty queen treatment, transforming them into adult-sized versions of their daughters on Anderson Cooper show. 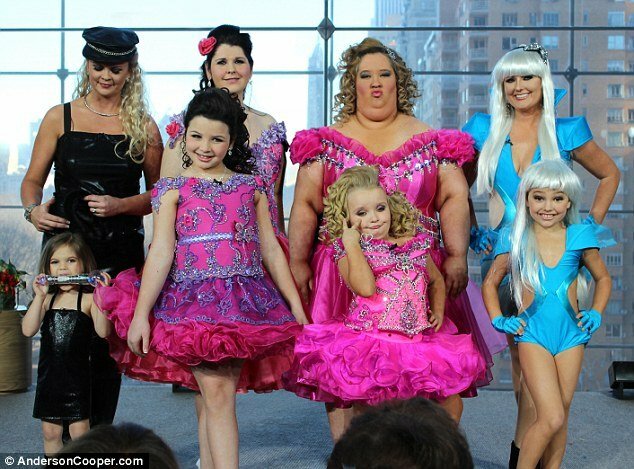 Anderson Cooper and his team have taken TLC’s Toddlers and Tiaras’ four most famous mothers and given them pageant makeovers – even going as far as dressing them in copycat outfits to mimic their daughters’ favorite competition costumes. The results, while hilarious, are an attempt by Anderson Cooper to encourage the controversial women to think differently about dressing their young girls up and asking them to perform in the revealing outfits and make-up. Six-year-old Alana Thompson, aka Honey Boo Boo Child, looked like a miniature version of her mother, June Shannon, from McIntyre, Georgia. June Shannon, the self-proclaimed “Coupon Queen”, said she found the corset a little tight, but apart from that she was determined to see the humorous side of the get-up, echoing the mothers’ attitudes towards the pageant world as a whole. “We have had a blast,” June Shannon said of the day at the studio. When questioned ether the outfit may make her change her philosophy towards child beauty pageants, it became clear the embarrassing makeover experience had made no impact. “I don’t rethink any decision that I’ve made for my daughter as far as pageants,” June Shannon said. June Shannon insists on the programme, airing Thursday, February 16, that the highly criticized pageant world is nothing more than a sport. When asked whether she had indulged in any “GoGo Juice” – the caffeine-heavy mix of Red Bull and Mountain Dew she famously uses to energize her child – the larger-than-life June Shannon pointed out that Anderson Cooper and the audience had drunk it all. Indeed, at one point, the host takes a swig from a bottle and declares that the potent mix is “very sweet”. “I don’t give her GoGo Juice everyday of the week,” explains June Shannon. Anderson Cooper suggested that the audience had found the diminutive outfit “surprising” for such a young child, but the mom disagreed. Happily for the mothers, there is another team of parents – namely, Lifetime’s Dance Moms – who are perhaps even more eyebrow-raising than they. Speaking about eight-year-old EverRose’s diet, Kayla said she simply did not want her children to ever reach the weight of 300 pounds – as she once had. “Obviously it does look like my child lost ten pounds in a couple of weeks,” the mother said of TLC’s editing. “If I could do that I would bottle it, I would sell it and I would be a millionaire. Also, I would be skinny too. Kayla explains that she aims to teach her children to be as conscious of diet and exercise as they can be so that they do not have to deal with the bullying caused by obesity. “I have four children and I want them all to not live the things that I have lived, as we all have experienced things in our lives that we don’t want our children to deal with,” Kayla emotionally revealed.